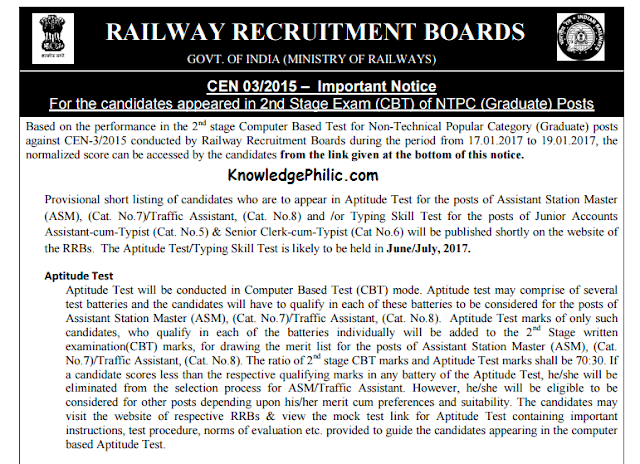 25-05-2017 Railway NTPC RRB Issued an Notice Releasing link to view RRB NTPC Mains Score with some Important Notice For the candidates appeared in 2nd Stage Exam (CBT) of NTPC (Graduate) Posts. following is the Highlights of said Notice and you may download this Notice in PDF from the link provided below. 2) The Aptitude Test/Typing Skill Test is likely to be held in June/July, 2017. 5) The Roll numbers of the shortlisted candidates for Aptitude Test/Typing Skill Test to be published on the RRB websites shortly. 6) This list will not include roll numbers of candidates for the posts of Commercial Apprentice (Cat.No.1), Traffic Apprentice (Cat. No.2), ECRC (Cat. No.3) and Goods Guard (Cat. No. 4) based on their merit and sequence of options.